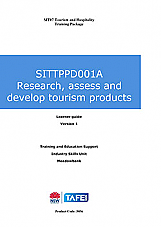 This learner guide will assist the learner to develop the skills and knowledge required to manage product development strategically within tourism and hospitality organisations. 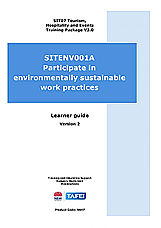 This SITXENV001A Participate in environmentally sustainable work practices – Learner Guide supports the development of environmentally sustainable skills and knowledge to be able to apply these to the work role and work practices. It targets all workers employed in tourism, hospitality and event organisations.